Photo by Jon Bransfield for The Ballyshaners, Inc. Located just south of the nation's capital in Washington, D.C., the city of Alexandria, Virginia celebrates Saint Patrick’s Day with family events including a classic car show, a dog show, and a Saint Patrick’s Day Parade. Federal, state, and local elected officials, the Irish Ambassador, military commanders, and other local celebrities participate in the Alexandria parade each year where local scouts, marines, and high school bands are also be represented. Thousands line the streets, and this year's parade promises four or more pipe bands, performances from Irish dance schools, the Notre Dame Alumni Band, and more than 100 additional parade units. 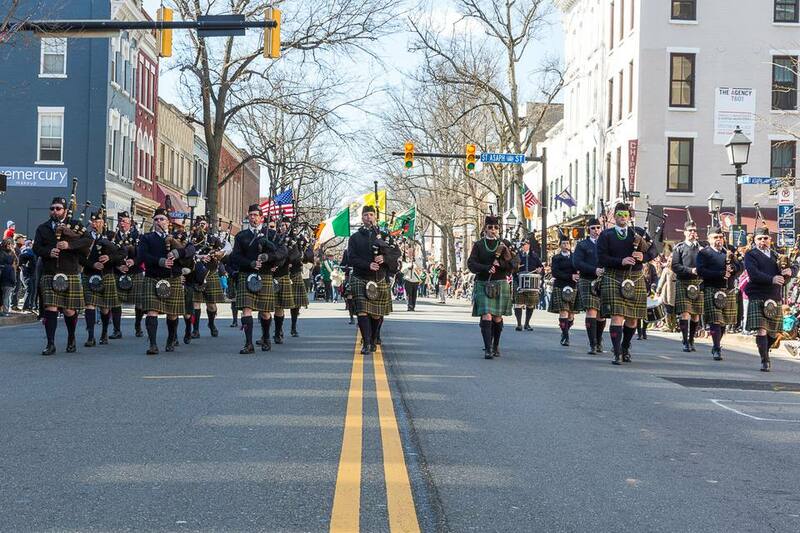 Organized by the Ballyshaners, a non-profit organization that promotes Irish heritage, the Alexandria Saint Patrick's Day Parade takes place on March 2, 2019 at 12:30 p.m. The entire festivities run from 11 a.m. to 2:30 p.m. The parade traditionally starts at Alfred and King Streets and runs along King turning east on Lee Street ending at Cameron Street. Public transportation is suggested due to limited parking in the area, and you can take the Metro to the King Street stop and walk about 10 blocks to the east to arrive along the parade route—if you'd rather not walk from the metro, take a DASH bus for a few extra bucks. To drive to Old Town, where the parade takes place, take the George Washington Memorial Parkway to East King Street, and don't forget to check this interactive map and directions from around the region if you get lost. Although parking is limited, especially on special event days like Saint Patrick's Day, there are parking meters on the streets surrounding the parade route and even a few parking garages in the area. Keep in mind these can get expensive and fill up quickly, so plan ahead and arrive early if you simply must drive to the parade. Following the parade, many people will head to nearby Irish restaurants to continue the celebration and enjoy some Irish cuisine, beer, and music, and you won't want to miss the chance to drink some green beers at area pubs or eat some haggis at local Irish restaurants if you're in town for Saint Patrick's Day. Among the top spots to get some Irish food and drink, Murphy's Grand Irish Pub has long been a local favorite, as have Daniel O'Connell's Restaurant and Bar and Fiona's Irish Pub. In nearby Arlington, Virginia, you could also visit Samuel Beckett's Irish Gastro Pub at the Village at Shirlington, The Celtic House Irish Pub and Restaurant, or Sine Irish Pub and Restaurant. The Alexandria Saint Patrick's Day parade is just one of many St. Patrick's Day events in the Washington, DC area. For information about all of the celebrations around the region, check out our guide "St. Patrick's Day in the Washington, DC Area." If you have time, we recommend checking out more than one event!